Word has reached us that the Library of Congress has finished the restored feature documentary World War I film On the Firing Line with the Germans (1915) by Wilbur H. Durborough, the American camera correspondent who accompanied the German offensive on the eastern front in the summer of 1915. Out of the original footage found at the Library of Congress and the National Archives, with additional input and film found by the authors during our research for our latest book American Cinematographers in the Great War, the staff of the Library of Congress has edited a restored digital copy running 1:48 minutes. The new film will be shipped to Pordenone, Italy, for a premiere exhibition during its Silent Film Festival in October 2015, one hundred years after the film was first shown in the United States. More on the upcoming exhibition in this weblog! When the First World War broke out in 1914 American media responded with great interest. There was a substantial public demand for news about the war and newspapers were eager for stories. Film also was soon being used to promote the war coverage by American newspapers. As described in our book American Cinematographers in the Great War , it didn't take long before newspaper editors discovered the advantages of covering the Great War both in print and motion pictures. The way the Chicago Tribune handled this offers a prime example. 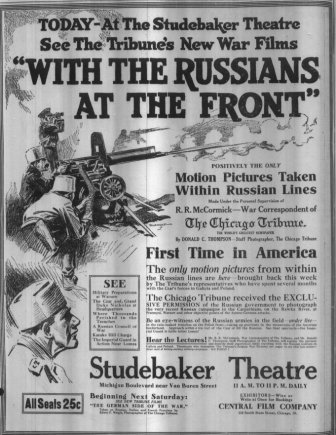 By using a cross-media approach, the Chicago Tribune took out a massive advertising campaign in 1914-1916 to promote its own war documentary films. The blazing publicity not only expanded the Tribune's money. Circulation of the newspaper was also stimulated this way. Art work was especially important in these advertisements. As cameramen soon found out when they filmed the First World War, from a photographic point of view the military conflict was very hard to cover. Lighting conditions were terrible at the western front. Also, as most of the activities took place in the trenches, there usually wasn't a trace of the enemy and No Man's Land seemed like a wasteland. As a result, most of the footage was taken behind the firing line and contained repetitive scenes of infantry marching and drilling, military inspections, artillery practice, etc. Gone were the days of the drummer boy, the bugle call and the charge of the Light Brigade. This was modern warfare. It was muddy. It was messy. It was something completely different. 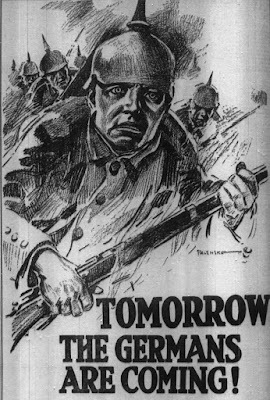 To compensate for the lack of exciting documentary footage the publicity department of the Chicago Tribune relied heavily on professionally drawn illustrations of infantry charges, close-ups of soldiers going over the top and the like. The most interesting advertisements have been selected in these slide shows. Enjoy! World War I cinematographer Wilbur H. Durborough recently made national headlines in Holland, when it was discovered that in his film On the Firing Line with the Germans (1915) there is a short historical scene showing suffragette leaders Aletta Jacobs and Jane Addams. This discovery made it to prime time news on Dutch TV and radio. Here's a link to this scene. 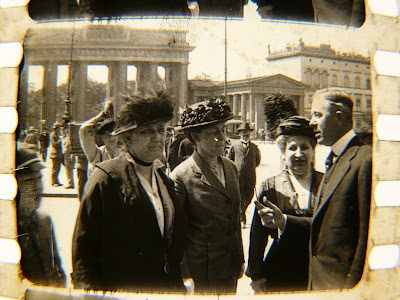 The film fragment, which was also described in our latest book shows the peace movement leaders Aletta Jacobs from Holland and Jane Addams (US) in front of the Brandenburger Tor in Berlin on May 21, 1915, on their way to visit the German Secretary of State and the Reichskanzler with a peace mediation proposal. In this scene Durborough can be seen talking with these ladies. The movie has the only known extant film of Jacobs who was a leading suffragette in the Netherlands. The film also shows Jane Addams who won the Nobel Peace Prize in 1931. The discovery of this historical footage as well as the support of the International Network of Museums for Peace (INMP) has contributed to the reconstruction of Durborough's film by the Library of Congress. The reconstructed Durborough World War I film is set for screening at the upcoming Pordenone Film Festival in October 2015. The Dutch Film Museum EYE has also expressed its interest in showing the Durborough film in Holland. We will keep you posted on this special screening at Pordenone! In November 2016, the Library of Congress released the restored Durborough film online. The scene showing Captain Steiner taking off with his plane was found at the Library of Congress. Additional research for our latest book has shown that Weigle was accompanied by Captain Gschliesser - perhaps one of the officers in the picture above - of the Austrian military press office. 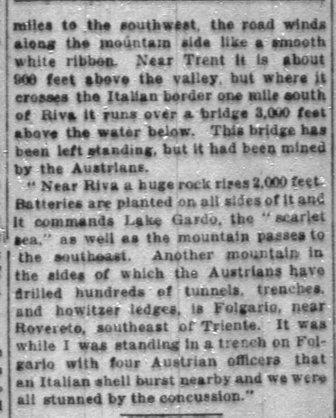 They were at Lavarone, Folgara and the Ortler area. Gschliesser also censored Weigle's footage. 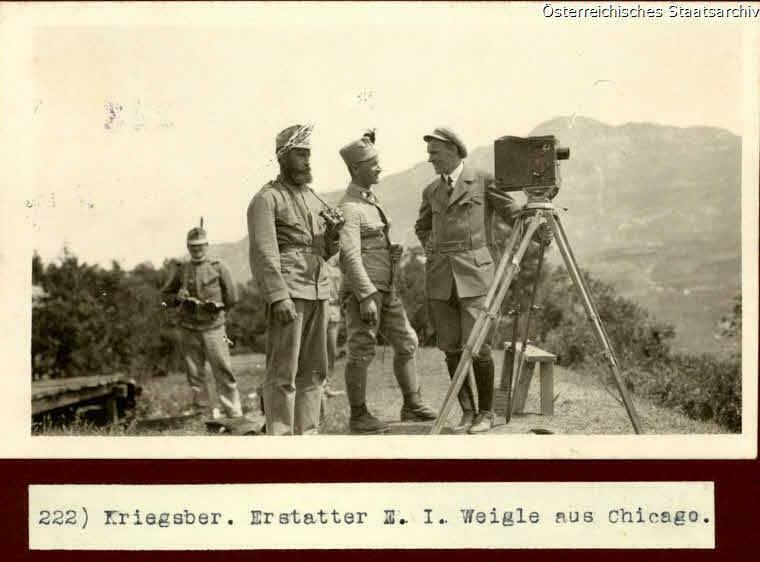 When Weigle left Vienna, the Austrians supplied him with additional war scenes from their film archives. Despite all courtesies Weigle clearly was an "embedded" film correspondent. 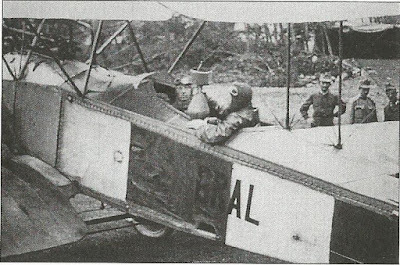 Since we published this book, some tantalizing new pieces of information on Frank Kleinschmidt's World War I movie adventures have been found. On June 2, 2014, the Austrian government opened the exhibition Extra Ausgabee! on the k.u.k. Kriegspressequartier, the Austro-Hungarian military press office during World War I. Kleinschmidt was attached to this press office as an accredited war reporter between February-December 1915. 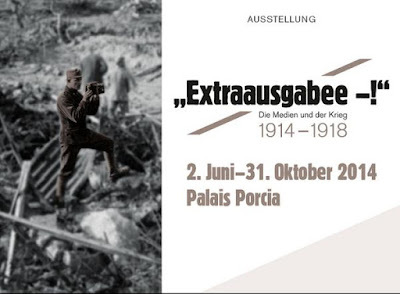 Among the many interesting photographs presented at this exhibition in Vienna was a picture showing Kleinschmidt cranking a movie camera in the company of a squad of Austro-Hungarian soldiers. The caption - translated into English - says: "The American film operator Captain Frank E. Kleinschmidt, with the 32. Lft. Infantry Regiment in the trenches." Scenes showing Kleinschmidt at work while filming the Great War are rare, and while extremely fascinating this picture does present some problems. 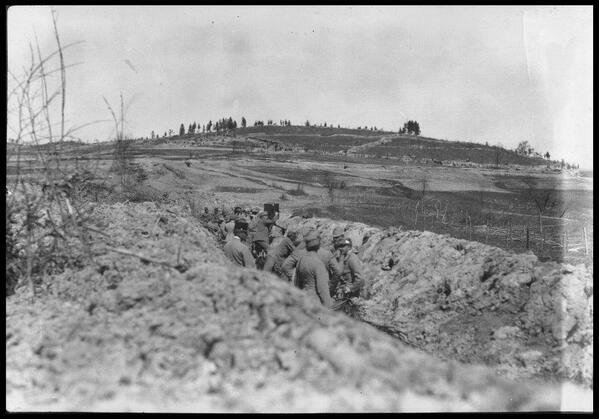 The photograph was taken from the backside of the trench, presumably at a great risk for the cameraman because he must have exposed himself as a target for the enemy. Judging from the easy-going behaviour of the soldiers, the scene probably was shot somewhere behind the actual firing lines for the purpose of getting a good picture. The caption is puzzling. The 32th K.u.K. Infantry Regiment was an Hungarian unit, based at Trieste near the Adriatic Sea. This fits in with Kleinschmidt's work at the military press office. 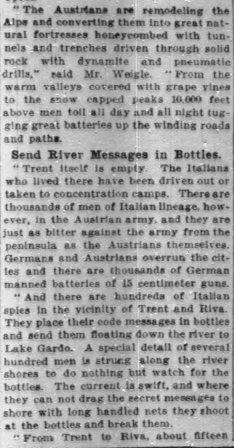 From November 6, 1915, he was attached to the staff of the 16th Army Corps at Trieste. 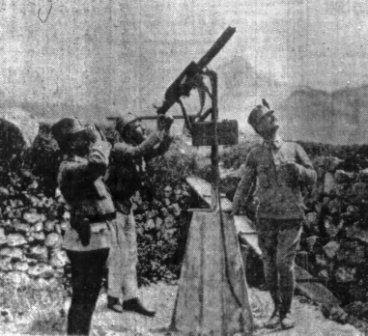 Apart from filming Austrian mine sweeping activities, Kleinschmidt covered an air raid on the Italian coast from the Trieste frontline. However, the Austrians had no such military unit as a "Lft. Inf. Reg.". "Lft." was short for Luftfahrtruppe, the Austrian World War I airforce. Perhaps this specific picture was taken with the assistance of a detachment of airforce soldiers based near Trieste. The collection of the Austrian World War I exhibition also revealed a remarkable picture taken by Kleinschmidt in Galicia, during the 1915 Austro-German offensive on the eastern front in Russian Poland. This picture was reproduced in our latest book as a publicity shot for his film War on Three Fronts. 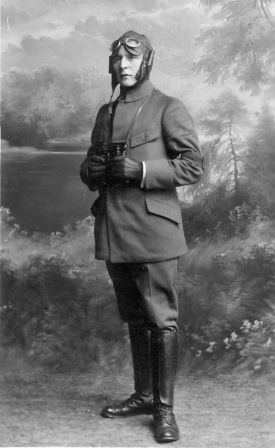 The presentation at Vienna showed that Kleinschmidt's photograph was also published in the Austrian press, presumably because he was part of an official Austro-Hungarian photographic unit. 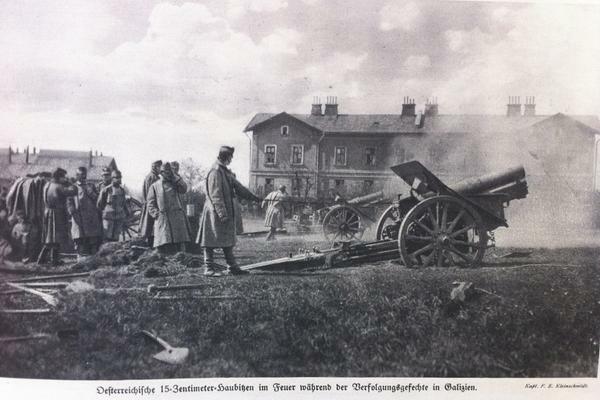 The picture appeared on July 15, 1915 in the Weltspiegel and shows Austrian gunners manning a 15-centimeter battery of artillery. This scene later became part of Hollywood legend and history, because it was bought by director D.W. Griffith when he was working on his World War I drama Hearts of the World (1918) with actresses Lilian and Dorothy Gish and his cameraman Billy Bitzer. In Griffith's version the Austrians were introduced as brutal German soldiers threatening a peaceful French village. Clearly, several liberties were taken by Griffith with historical events. Kleinschmidt, as we found out during our research, was very much disappointed Griffith hadn't used more of his war film. He also offered his services to Griffith as an actor and military advisor for any possible upcoming new war films. The exhibition is particularly interesting because of the attention it gives to the way the Austro-Hungarian government used modern pictorial media such as films for wartime propaganda purposes. In this respect the Dual Monarchy was - compared to the Germans as well as the Entente - clearly open to a more modern approach. A publication on the Austrian World War I exhibition can be seen and downloaded here. 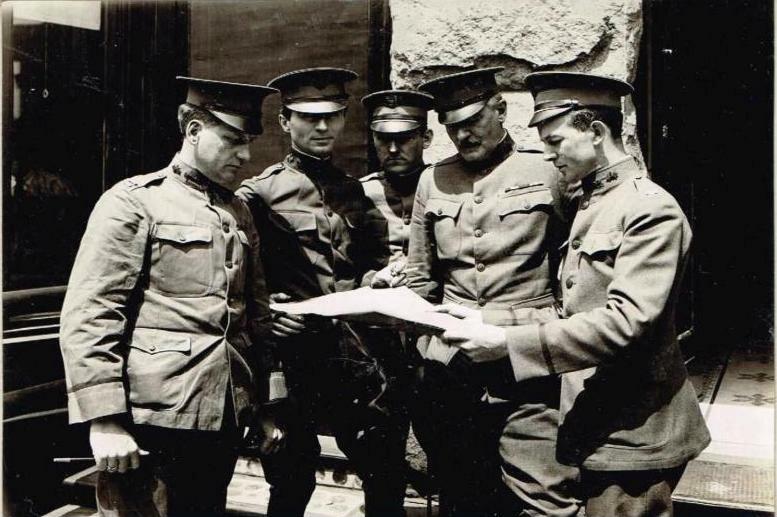 Surprisingly little-remembered now, author/war correspondent/explorer and lecturer James Barnes played an important role when the U.S. Signal Corps was assigned to make official films and pictures of the American entry into World War I. A rare combination of Ernest Hemingway, Lowell Thomas and Richard Halliburton, Barnes not only was a prolific writer who produced 28 books and hundreds of short stories, he also headed the U.S. Signal Corps Photographic Division. As described in our book American Cinematographers in the Great War, among the men Barnes first recruited as photographic officers were Edwin F. Weigle and Albert K. Dawson, cameramen who had gained first-hand experience as war reporters in Europe. Born in Annapolis, Maryland, in 1866, Barnes graduated from Princeton University and launced a succesful career in journalism. He served as a lieutenant in the First Battalion of the New York State Naval Militia during the Spanish-American War. Following six years as a war correspondent in South Africa and Venezuela, he became a literary editor specializing in books about American naval history. Commissioned Major in the Air Service of the Signal Corps in July 1917, Barnes was ordered to set up a new Photographic Division. Barnes had been head of the Princeton Flying School and he was a notable war correspondent, but his personal experience in photography was - as he admitted himself - extremely limited. The main reason why he was given the job seems to have been his coverage of an expedition across Africa in 1913-1914, together with Cherry Kearton, the famous British naturalist photographer and cinematographer. 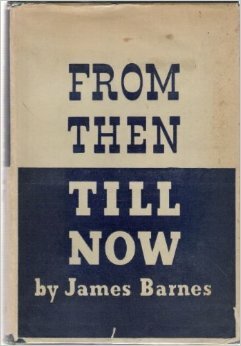 As Barnes mentioned in his autobiography From Then Till Now (1934), the Photographic Division in these early days had a hard time setting up operations. The Division was seriously understaffed, but by September 1917 and with the assistance of the British two detachments of photographers had been sent to the European front and a program for camera production was laid out both for still photography and motion picture coverage. In 1918, Barnes was given charge of the U.S. School of Aerial Photography at Kodak Park in Rochester, New York. Under his supervision 25 officers were commissioned and about 300 American cameramen were sent overseas to the war zone. His contribution to the American films of World War I was in a word significant. From 1918 until his death in 1936, James Barnes served as President of the Naval History Society. His life and work during World War I definitely merits further research. Barnes' personal story on the U.S. Signal Corps Photographic Division can be read here at these pages from his autobiography. On June 25, the First Division Museum in Wheaton, Illinois, presented about two reels of the Chicago Tribune's World War I film With the Russians at the Front, which was originally released in America in August 1915. The remaining footage runs for about 23 minutes and although some scenes are out of place the film presentation is very interesting. Here is the video on YouTube. The footage of this American World War I film comes from the Museum of Modern Art in New York City. The movie was shot by Donald C. Thompson who accompanied Robert McCormick, editor and owner of the Chicago Tribune, during his trip to Russia and the eastern front. The presentation was introduced by film historian David Mould who has done previous research on Thompson. In his lecture Mould mentions McCormick's "tortured relationship" with Thompson, described by Mould as a "drunk" and a "rogue". After his arrival back in the United States McCormick sued Thompson because he never handed back his motion picture equipment to the Chicago Tribune. The video presentation on YouTube is interesting for several reasons. To accompany the original film McCormick's film lecture notes are used. David Mould also gives some useful background information on the way the Chicago Tribune got into the film business and how some scenes were reconstructed for the camera by Thompson. The film has also been described in our latest book on the American cinematographers of World War I.
David Mould mentioned in his speech that Weigle's film The German Side of the War (1915) has been lost. As described in our previous publications, the Library of Congress has several hundred feet of this Chicago Tribune film, and we also found additional footage in the Allen Collection. In addition, the authors have located footage of Thompson's movie With the Russians at the Front at the Library of Congress. So, perhaps we will be able to show these two World War I films again after one hundred years.